The 2018 Cronulla Spring Festival is not to be missed this year with old time favourites and plenty of new additions coming to Cronulla Mall and Cronulla’s Monro Park on Saturday and Sunday 8 – 9 September. 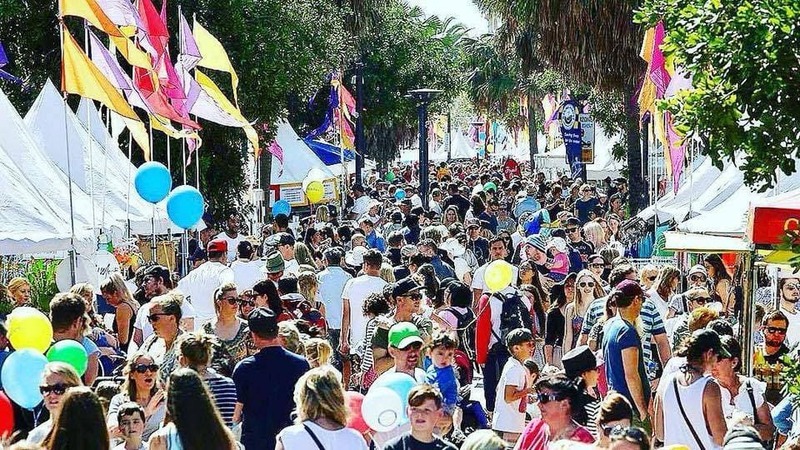 The beachside community festival is the Sutherland Shire’s biggest annual community event and will celebrate the start of spring with a memorable day out for friends and family alike. Children are a strong focus of the community event and last year’s introduced kids zone will be even bigger this year. Amongst others face painting, a pet zoo, slides and lots more will be on offer for kids of all ages. Children will also be the focus of one of the festival’s key additions, when Busk for a Cure artists will be performing live music acts across the festival for a good cause with 100% of the donations going to the Australian Kookaburra Kids Foundation. Kookaburra Kids offer a range of programs specifically developed to support children living in families affected by mental illness and it is the charity of choice of Cronulla Spring Festival organiser ATOMIK PRODUCTIONS. “We have been involved with cause-related and community events for a long time and we love delivering these types of events for the positive impact they have. So to include a charity partner into the Cronulla Spring Festival was an obvious choice for us, Thomas Staunton, CEO of ATOMIK PRODUCTIONS said. “We are very excited to be ATOMIK’s charity of choice for the 2018 Cronulla Spring Festival and can’t wait to get amongst it over the weekend,” Tracie Junghans, Kookaburra Kids Marketing and Fundraising Manager, said. “We are looking forward to be part of the 2018 Cronulla Spring Festival with our artists. It’s great to see the festival wanting to give back to the community and getting us involved. “Our vision is to use the power of music to support different charitable organisations. Over the past few months we have been working to collaborate with a variety of community events to raise funds and awareness for different causes and Kookaburra Kids is a great one to support,” Helmut Uhlmann, founder of Busk for A Cure said. The festival will also feature returning favourites and for the first year yet new features and interactive experiences will be on site to enjoy. Over 120 artisan stalls to shop, live music throughout and a variety of food trucks with local and international specialties as well as a licenced bar will be on offer. One of this year’s highlights is the free outdoor movie night in Monro Park on Saturday, 8 September, which will feature award winning movie, “The Greatest Showman”. Gates will open at 5:30 p.m. with the screening starting at sunset. Festival snacks and drinks will be available on the evening with guests recommended to bring their own seat. There will also be a free fitness session for all ages at Monro Park on Sunday morning. The session starts at 8:30 a.m. and will be run by event supporter and local shire business Transform 40. It is the second time in its over 30 year history that the Sutherland Shire’s largest annual festival will be run by atomik productions, who are part of local Shire company Sold Out Event Management. “We are thrilled to have the opportunity to be able to organise the biggest community event in the Shire in our own backyard the second year running. We were honoured last year to be trusted to take over the 30-year success story of the Cronulla Spring Festival by The Sutherland Shire Council and are very excited about this year’s event,” Sold Out’s Managing Director Kim Voss said. “We’ve had an enormous response from stall holders wanting to return or join the festival and have continued building the program with some new features as well. The involvement of our event partners Stewart Toyota and Highland Property and our event supporters Sutherland Shire Council, 7News, Shire Talk, Transform 40, Fleur Events and Sold Out Event Management as well as so many of the local business in the Shire has been key in developing an attractive program. “There will be things on offer across all age groups, so make sure to bring friends and family for two fun days out in Cronulla”, Kim Voss added. The Cronulla Spring Festival have partnered with Stewart Toyota for the 2018 festival and will be giving festival visitors the opportunity to win a brand new ‘Corolla Ascent Sport’. Festival visitors are encouraged to visit the Shire Talk stall in the main plaza to win this car and many other exciting prizes from local business. Highland Property Group is also an Official Event Partner and will be on site showcasing their business products and offering family fun activities. Most recently, Seven News came on board to support the Cronulla Spring Festival and will have the Seven News Live Experience on site, offering festival goers the opportunity to step inside the Seven News satellite truck to get a glimpse into Australia’s number one news service and understand how the news gets to air. Selfie opportunities with Seven News newsreader and other Seven stars will also be on offer, and young festivalgoers will have the chance to be a Junior Reporter. To find out more visit www.cronullaspringfestival.com.au.